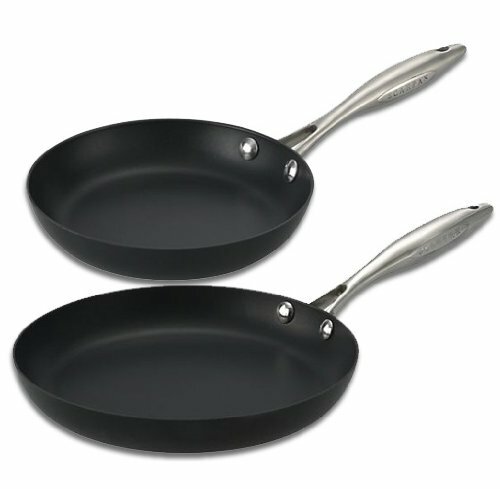 Fed up with buying non stick frypans? Have you found that none of the the non stick coatings last very long at all before the surface starts to scratch, and the non stick coating starts to disappear. So which type of cookware do we buy to prevent this from happening? After looking at all the reviews that I could find, I was still not sure which cookware to buy, hence the reason for writing this article. I will list some of the information I have found and see what you my readers have to add. I hope that this article will in fact help other readers going through the same indecision on which brand of cookware to buy. 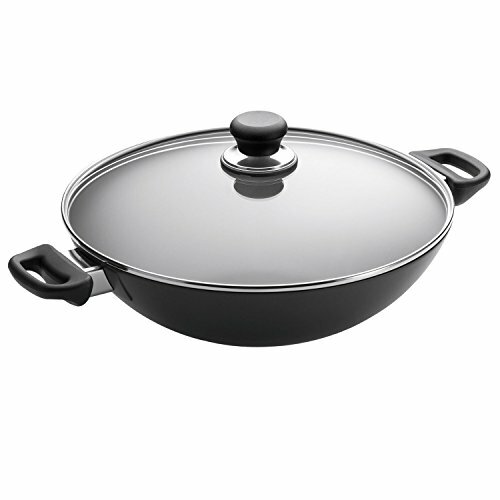 Scan pan Professional cookware combines the same cast aluminum technology of scan pan classic pans. These have the superior stainless-steel handles and lids. Each heavy gauge piece sits flat and retains heat evenly over surface, it also features ceramic-titanium nonstick finish. Scan pan cookware is safe to use on any burner, oven use up to 500 degrees F, and induction. Washing by hand instead of dish washing will preserve the non stick surface. The new PFOA - free nonstick finish is on all the Scan pan Classic and Professional cookware. Warranty - Scan pan covers its cast-aluminum cookware with a full lifetime warranty. After reading all the reviews available on Amazon and the internet sights. I have found many saying these are great although one said handles are hot, non stick good but starting to spot after 2 years. And one person said she had two pieces replaced 19 years after purchase. They do say they have a lifetime warranty so that is a definite plus. Well I just dived in and bought myself a Scan pan 26cm and 20cm Frying for $60.00 and free postage. So will wait for it to arrive and add my comments as to how it performs. Update: I can now tell you 7 months on that these pans are still looking good so far although I have since learned how to cook wiser in them. The Chef Stonedine cookware works on electric, ceramic, induction and gas stove tops. Company states that nonstick surface lasts ten times more than other pans, and wipes clean with a paper towel with no oil needed. Made in Germany and used in European kitchens. 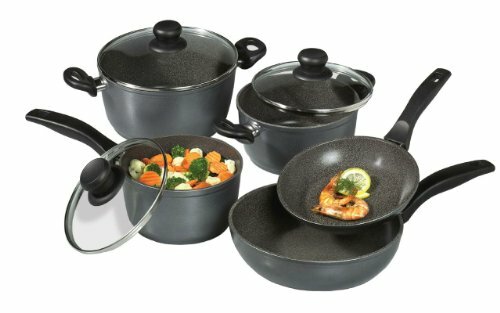 Stonedine cookware has strength of cast iron yet offers weight of aluminum and the stone coating is non stick to cook even eggs and cheese. Stonedine still gets hot enough to sear your steaks without burning. Warranty: Stonedine offers a 12 year warranty free from defects under normal use and service. Reviews: I have read so many different reviews that say these are magnificent, yet there are others saying the opposite. After deciding to purchase a set of stonedine cookware, I asked the dealer about the surface of the fry pans and the blistering and coating coming off. He promptly said that does not happen to the Stonedine, that is the cheaper product of Stoneline. Stoneline and Stonedine are the exact same product. The only difference is the company that sells it. Stoneline is sold by PS Marketing (SI) Ltd and Stonedine is sold by Brand Developers. Stoneline offers products individually and a wider range of cookware. Now I am more confused; who or what do you believe? Have you ever asked yourself "Where does that Teflon go?" This is the part that has always worried me, because yes, it goes into our stomach. Does it do any damage in there? I do not know the answer to that, but I am sure I will not be using another non stick frypan once it starts to blister and become damaged. Don't get me wrong I am still using them but with more caution and careful use. The pots are great except the water gets in under the knob on the glass lids. The fry pan started to scratch and peel even though we used the correct spatula, so it would not scratch. Annoyed my husband came up with an idea where we would still be able to use the fry pan, as a stainless steel one and not a non-stick fry pan. He spent about an hour using a combination of metal scratchy and sand. This picture shows the result. This gave us a good stainless steel fry pan, that we could use again without the risk of swallowing the Teflon coating. No it is not good for cooking pancakes, although we even did that by inserting a plastic sheeting then cooking pancake on that. It worked okay so we could still cook pancakes, although I will not be cooking them like that again. I have just cooked a lovely scrambled eggs, with bacon and green beans and it did stick a little bit. But my steel scourer will take that off in a second. Picture of Scrambled eggs cooked in this stainless steel fry pan with no teflon now. Its a pleasure to cook in wish I had done it earlier. We have not looked back since removing the teflon. This is a terrific stainless steel fry pan now. It has been eight months since removing the Teflon from this pan and we have used it to cook virtually everything and it was great. The only thing I would stil not try to cook in it now is pancakes. We told someone about doing this the other day and guess what they said. The pan would warp if we did that. How wrong was he? Although at the same time, we have done this on a deep straight sided pan. I can not comment on how a sloping sided shallow pan would react. But if it is a good heavy based pan I cannot see this happening. Be careful and look after your non stick teflon coated cookware and avoid cooking chops or anything with bones in the meat this will help make it last longer too. Please leave a comment and let me know if you have thought of removing the teflon instead of throwing away a perfectly good frypan that you bought with your hard earned money. Or any other thoughts on non stick cookware.